It has come to my attention that i am being accused of arguing with armada members on the armada discord, however they did not adress me about such issue but rather went behind my back and talked to another fleet leader. This pisses me off greatly. So much so i have decided to abandon discord for myself personaly and only connect to teamspeak from hence forth. I leave the choice what to use to the members as by our fleet charter , free will and all. I am sure you will use your prefered voice communication program. Please try and if able to recruit new members into the fleet to aid my quest. The armada is having a recruitement contest and we can win goodies for the fleets. General forum / Re: how many lights do you see? destroy the first group of enemy's , the benthans will deputize you then and a wave of 5 enemy groups will come in , one after the other. Destroy ships until you have destroyed 4 waves. Do NOT destroy the final wave , warp out and begin the patrol again. I am unimatrix , fleet leader of -NewDawn- , -GreenDawn- , -BlueDawn- , -PurpleDawn- & -UltimateDawn-. If you have not noticed those are all fleets from the secondary SAW armada you also are a member off. Soon there will be an armada wide event to help fleets with recruitement, im sure more emails will follow about said subject. However we from the dawn fleets wanted to give you some support with your recruiting in form of starbase access. 2) you park a character in newdawn so you can send the map invites to your members when the need arises. Also we would like to offer the possibility of transferring a character to our fleets to purchase items and use our provisions and once completed return to the fleet they came from. We are well provisioned in our fed fleet so we dont mind. So get in touch and we can work something out. Glad to have you on our side! Announcements / The 2018 Risa Lohlunat Festival! We’re excited to announce this years, annual Lohlunat Festival Festival! 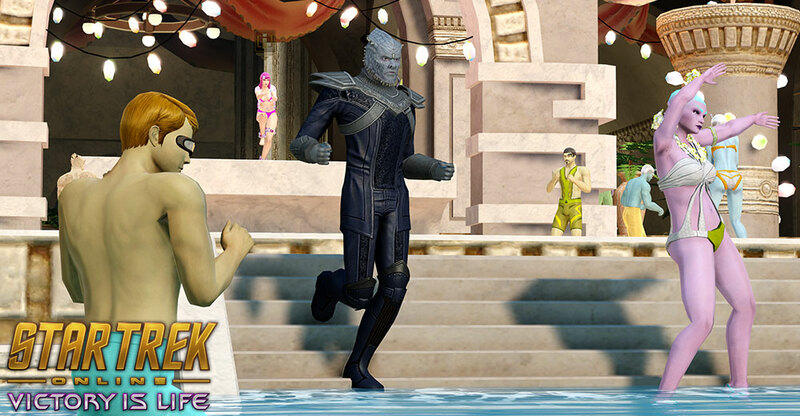 From July 3rd at 8am PT, to August 16th at 10am PT, come to Risa to experience this festival of love and friendship, and some rewards that continue this year’s Deep Space Nine theme! I wanted to take the oppertunity to write the first member introduction , i dont really think its really required because you all either heard of me or know who i am. I am thomas aka unimatrix , born & bred in belgium,europe. Important news they wish to share with the fleet. This gets posted on the frontpage so keep it sane ladies & gents.